Chapstick, dandruff shampoo, and Viagra all share one thing in common: there is no sales tax on these products in many states. 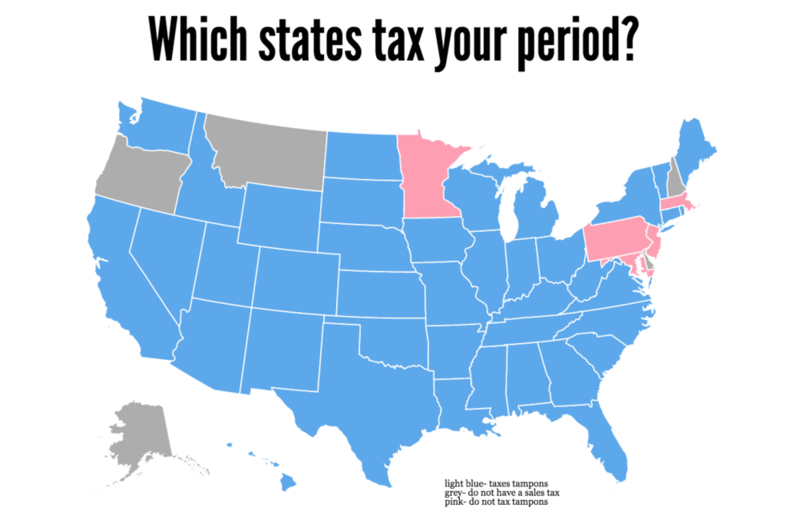 Meanwhile, tampons and other menstrual products are being taxed in more states than not. Taxes on tampons will cost consumers between $100 to $225 in a lifetime. While that may not seem like a lot for a lifetime, the government is collecting more than $275 million dollars a year from a basic health necessity. In the last five years, California has been leading a major push to change this. In 2017, Assemblymember Garcia introduced the bill again, but it did not pass the assembly, where it was introduced. It is speculated that the assembly rejected Garcia’s bill because counties and cities would not be reimbursed for the revenue lost from the tampon tax. From the assembly members’ perspectives, it would be hard to explain to their constituents how they planned to find funds to replace the revenue loss, which would be potentially damaging to their reelection campaigns. Furthermore, Assemblymember Garcia came under fire in 2017 when one of her political opponents and fellow Democrats Daniel Fierro claimed that Garcia, chair of the Women’s Caucus and a leader of the #MeToo movement, drunkenly groped his body. These claims were thoroughly investigated and found to be false. Although she was not found guilty of sexual harassment toward Daniel Fierro, she was found guilty of vulgar language with others and was thus forced to take disciplinary classes. Despite recent events, Assemblywoman Garcia is continuing her fight to remove the tampon tax for Californians. In December 2018, she introduced her bill again, with the outcome of the tampon tax bill, introduced as AB 31, looking brighter than before. The bill itself has been proven to pass through the legislative body and the greater obstacle, the governor, has now changed. Governor Gavin Newsom has recently declared himself as a feminist and proven this by declaring that he would budget nearly $2 billion towards early childhood education and six months of paid family leave. So, what is the tampon tax? Unfortunately, the layman's term for this bill is misleading since the bill’s goal is to remove the sales tax from menstrual products. According to the National Public Radio, “While there is no specific tax on tampons, in states that don't tax medical and health supplies, tampons are excluded from those tax-exempt categories. Hence the term ‘tampon tax.’" The feminist movement took a liking to this bill. Ten other states followed Garcia’s lead. Meanwhile, three other states are in the process of making a decision to exempt taxes on menstrual products. In fact, their claim is not wrong when you analyze how sildenafil or the name-brand version Viagra came to be tax-exempted. Viagra is meant to treat erectile dysfunction and pulmonary hypertension. The latter can be resolved with other medicines. Therefore, the requirements to exempt Viagra from the sales tax is perfectly legal since it is considered to be a medical device or drug. However, it is incredibly economically misguided when there are unresolved solutions in need of budget space, such as tampons and pads.